The films of the Marvel Cinematic Universe aren’t just connected by plot and characters, but also by the more subtle callbacks and easter eggs that populate the movies. Some of these references are sneaky enough that you may need multiple viewings to catch them though, or at least a helpful Redditor to point them out to you, as is the case with this Captain America: Civil War find. By Steve Rogers’ third film, the titular hero had gone a long way, from a scrawny wannabe soldier in the 1940s to a world-famous hero and Sokovia Accords-breaker in the present day. But one man who’s played a consistent part in Cap’s standalone adventures is his friend Bucky Barnes. While the pair aren’t on the best of terms in The Winter Soldier, for Captain America: The First Avenger and Civil War, Steve and Bucky are all too wiling to stick up for each other, which brings us to this image that was recently posted to Reddit. 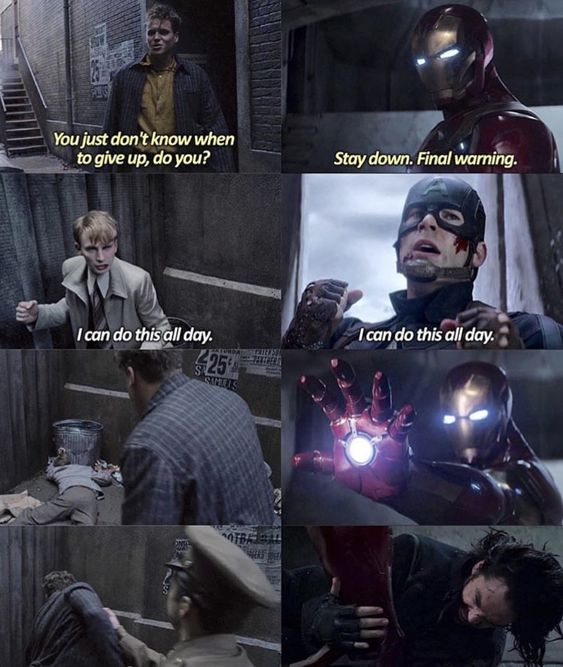 As you can see, there are some striking parallels between Steve’s back alley scuffle in his first movie and his fight with Iron Man in Civil War. In both cases, Steve looks like he’s beat, and his attacker even gives him a chance to give up, but our hero instead stands his ground and tells his adversary, “I can do this all day.” It’s at this point that Bucky steps in unexpectedly to help him out. After all these years, Bucky still has Steve’s back. Of course, Captain America: Civil War may prove to be one of the final chapters in this pair’s friendship, since Bucky ended up being the first victim we see turn to dust in Avengers: Infinity War. And while Avengers 4 looks to feature the return of many disintegrated victims, things might not turn out so well for Steve.